June 2013 - The team at Diamond Select Toys loves Star Wars, and they love droids, which is why they've made a few different droids in their line of vinyl Star Wars banks. R2-D2, R2-R9 and R2-Q5 have all made their way into collectors' hands, and now there's a new droid headed to San Diego! This year's Comic-Con International exclusive Star Wars bank is R2-B1, one of the astromech droids assigned to the Royal Shuttle of Naboo, and tragically lost while making repairs during a battle. The 10-inch vinyl bank has a coin slot on the back for inserting change and an access door on the bottom. Sculpted in 1:4 scale, R2-B1 is in scale to DST's Yoda bank, Jawa bank, and all of their Ultimate Quarter Scale action figures. 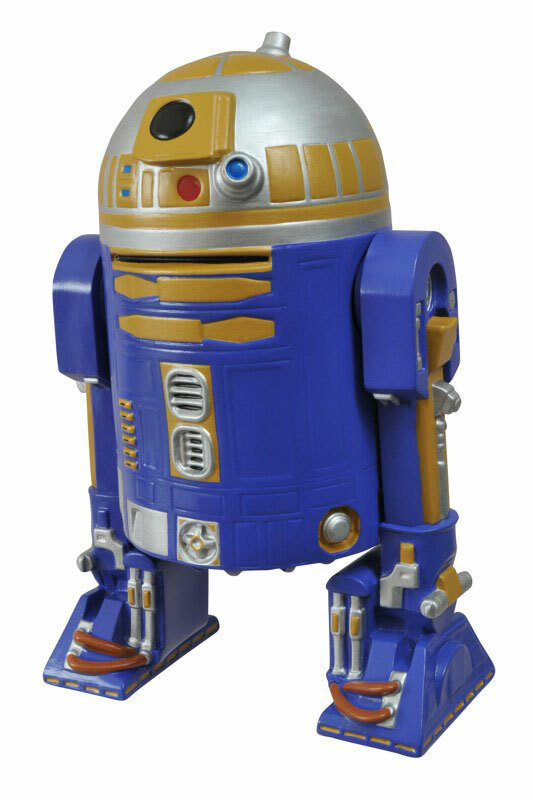 R2-B1 will be available for $23 at the Diamond Select Toys booth, #2607, as well as at various retailers around the show floor. Limited to only 1500 pieces, this droid will get picked off fast, so keep that targeting computer on!